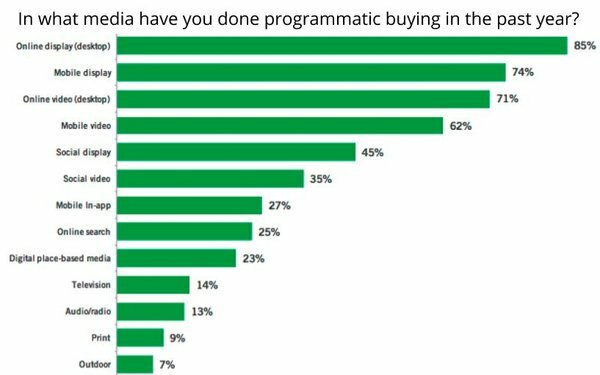 Programmatic media-buying may be associated most with digital media channels such as display, search and social, but the reality is it is transforming the way big brands buy all media. That’s one of the major takeaways from the Association of National Advertisers recently released Programmatic Media Buying report. While online and mobile media do dominate in prevalence of programmatic media-buying, all media are now being bought in significant amounts via programmatic platforms, including television, radio, “print,” and even outdoor. The percentage of ANA members citing the so-called media may be small, but it is growing fast as brands and agencies embrace automation, superior data targeting and platforms to make their media dollars more effective and efficient. Not surprisingly, after online and mobile, out-of-home is the most dominant medium bought programmatically, thanks in part to ability of digital out-of-home media options to easily integrate into programmatic’s digital interfaces. Twenty-three percent of ANA members responding, cited using programmatic technology to buy digital OOH media. Another 7% cited using it to buy conventional outdoor media, such as billboards and signs. TV (cited by 14% of respondents) and radio (13%) are the next most common programmatically-bought media, followed by print media such as newspapers and magazines (9%). 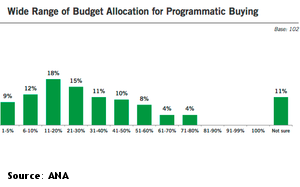 The report does not discuss the impact programmatic has had on ad budgets allocated by medium, but overall, it is beginning to have a profound impact among ANA members, with respondents reporting well into the double-digits of their total spending (see range of responses below).